EXAMINATION: Notice For Admit Card Distribution of B.Com. Part–III (Honours) Examination, 2019 (Under 1+1+1 System). EXAMINATION: Notice For Provisional Admit Card of Compulsory Language B.A./B.Sc./B.Com. Part–I Examination, 2019 (Under 1+1+1 System). PCP: PCP Schedule of Post Graduate Bengali (PGBG), Part-I, Paper-IV for July 2018 Batch. PCP Centre: Women’s Christian College & Sarojini Naidu College. 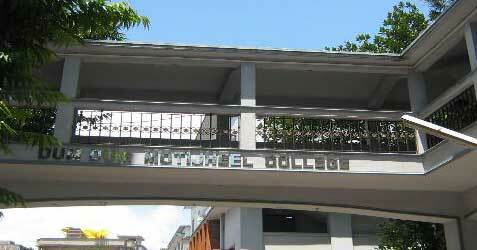 Founded in 1950, the Dum Dum Motijheel College, is one of the premier academic institutions of West Bengal which intellectually inspires and morally encourages the youth to meet the global challenges of West Bengal. The College stands for academic excellence, enrichment of skills and character formation so as to enable students to excel in the field of their choice. Since the day of its inception on August 28, 1950, the College has set itself the mission of creating human wealth by imparting quality education to young learners of diverse socio-economic backgrounds and inspiring them to grow as responsible citizens and good human beings. Our undergraduates choose from 22 Honours and General courses. At the Post graduate level, we offer 2 Masters programs. Two separate campuses are there for Graduate and Post graduate courses. With the introduction of a number of job-oriented newly emerging subjects, the College has reached a new level in the pursuit of its overall development.